Global Manager Group is industry leader for online documents selling for various international system certification, has released the new product online under documentation category named as D141 – ISO 15378:2015 Documentation kit for medicinal products packaging materials manufacturer’s certification. The ISO 15378 – Primary Packaging Materials for Medicinal standard was developed in the pharmaceutical sector to provide a Quality Management System (QMS) for suppliers of materials intended to be used as Good Manufacturing Practice – GMP in packaging for medicinal products. This documentation released by GMG is covered all requirements of ISO 15378:2015 certification. List of readymade templates given by GMG under this product for ISO 15378 Certification for primary packaging material for medicinal products with reference to quality management system and GMP contains a set of total 150 editable word files are divide in 7 directories like manual, procedures, exhibits, forms, process approach, SOPs and audit checklists etc. Global Manager Group provides readymade ISO 15378 documents that can be easily customized to meet the specific needs of your organization. GMG provides documents like ISO 15378 manual, procedures, exhibits, SOPs, forms and audit checklists etc. as per the ISO 15378 Documentation requirements. All the documents are designed under guidance of experienced ISO consultants and QMS auditors. The ISO 15378:2015 documentation kit is the complete resource for all implementer as it provides the necessary tools for the major phases of the implementation of the ISO 15378 standard. The complete sets of ISO 15378 documents designed to minimize the time and cost involved in certification as well as provides better control over implemented QMS system. The ready to use sample templates are written in simple English and easily editable format. The user can update total documentation templates as per organization working system and create own documents for their company. 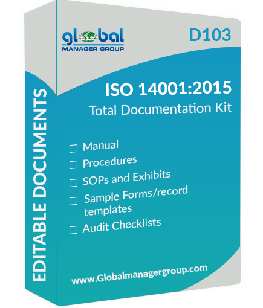 This product, ISO 15378:2015 Documentation is offered online by Global Manager Group at very competitive rate of just $899 with free Demo that help to understand each document in details with its clause wise requirements on company’s web portal www.globalmanagergroup.com.